“Whoever comes into the marketplace is going to have to work through us” – those were the strong words of then CEO of Vodafone, Arun Sarin in 2007. Arguable he missed that one by a few football fields. Whether greed, arrogance or technical ineptness served to marginalize mobile operator as the universal payment and billing gateway is up for debate. But there are places where they do still matter. Of course, this considers all mobile commerce transactions. One can argue that for micro-billing (i.e. app purchases etc), they still do matter, as fixed costs from card networks and banks often can then be compared to the high % fees charged by operators due to the lower Average Order Values (AOVs). 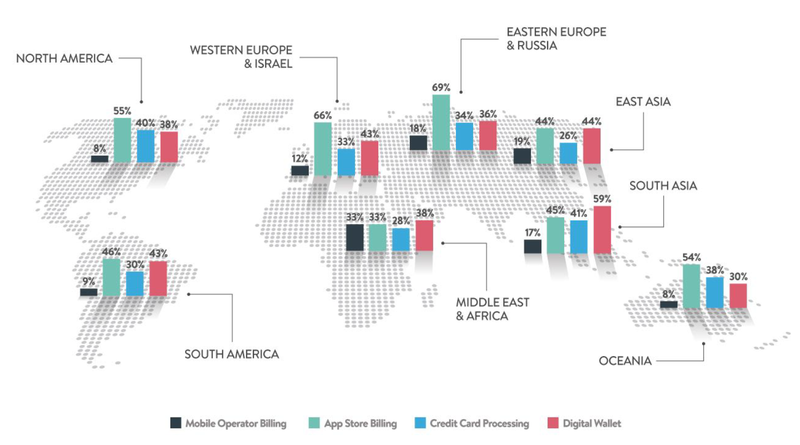 Needless to say, companies who are entrenched in the mobile operator billing business may not be the most objective source of information on the state of the industry, but industry leader Fortumo does point to quite healthy growth rates, with way over 100% growth rates in massive markets like Indonesia. What is the main reason behind this growth, besides increasing smartphone penetration? Well, few will argue that the one-click experience mobile billing offers is the key characteristic behind it’s attractiveness. But few will also dispute that greedy carriers who often keep 50% or more (still much the case in markets like Brazil and India), is some of the top reasons the industry shies away from using mobile operator billing. But even in markets like Indonesia, where payouts are in the 30% mark, we can see triple digit growth, which is impressive.